When cleaning engines, transmissions, suspension or brake parts and any other parts on cars, trucks, buses or trains, ARMEX is the only choice. 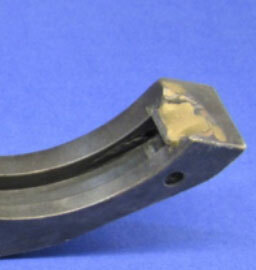 Use ARMEX when preservation of parts is required. Other hard blasting abrasives can remove surface materials from parts, damage threads and changing the specifications along with surface tolerances rendering the parts unusable. Use ARMEX to clean, degrease and remove burnt on carbon and paint on a wide variety of materials including steel, aluminum, lead, alloys, plastics, rubber and composites. Learn how users in Transportation markets use ARMEX to control costs and reduce rejected parts. Aluminum housing unit with attached steel/stainless steel stem. Exterior only.